Offset printing, also called lithography, uses a large printing press with a series of printing plates that transfer ink onto paper that is then cut, folded, and bound to form a final product. When you think of offset printing, think transfer. Each step in this printing technique involves the transfer of images from one material to the next — images are digitally transferred onto a set of plates that collect ink to transfer the images to a rubber blanket that then transfers the images to paper. There are two primary types of offset printing, sheet-fed and web. The most common alternative to offset printing is known as digital or print-on-demand printing. Sheet-fed machines use pre-cut sheets of paper, called parent sheets that are fed through the printing press one sheet at a time. They are best used for short or mid-range runs of 250 to 10,000. Web presses use a roll of paper that is continuously fed through the printing press. They are far more complicated than sheet-fed presses and can be as large as an entire building. 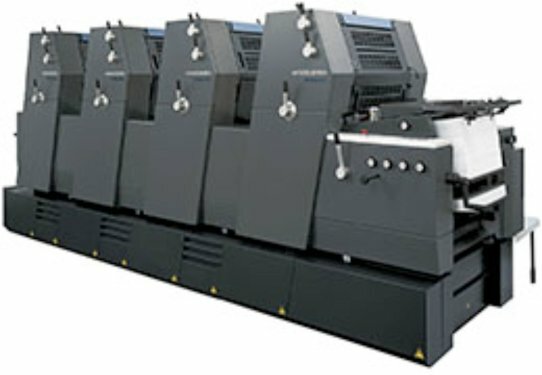 Web presses are used for high-volume printing (10,000+). Digital printing (also known as Print-On-Demand or POD) is not an offset printing method, but it’s a good one to understand. Digital printing uses equipment similar to a large home laser or inkjet printer. This approach is best used for small runs (1-150).